Q: I recently purchased my second bottle of Flourish and I noticed that the liquid in the bottle was a yellowish almost apple juice color whereas the original bottle I purchased contained a much darker liquid. Which one of these two colors should Flourish be? and is there anything good/bad for the aquarium as a result of the color of the Flourish? A: It is normal for the color of Flourish to vary from batch to batch as this is dependent on the temperature that this product was blended at. This is of no consequence to the function of the product. Q: Is the "guaranteed analysis" on Flourish per dose? A: Per dose, per bottle, per whatever unit of weight you choose; it is expressed as percentage by weight not in absolute weights. Q: Can I use Flourish on my garden vegetables? Q: I have a question about why you have phosphates in your Flourish? This is the #1 culprit in algae in aquaria. A: I believe if you check the amount of phosphorous content (< 0.01%) you'll see that at our recommended dosing this would only add 0.0005 mg/L (ppm) of phosphate to the water. This is completely negligible and poses absolutely no risk of algae growth. So unless you are planning on a 1,000 fold overdose you don't have to worry about ever getting any measurable phosphate from using Flourish. 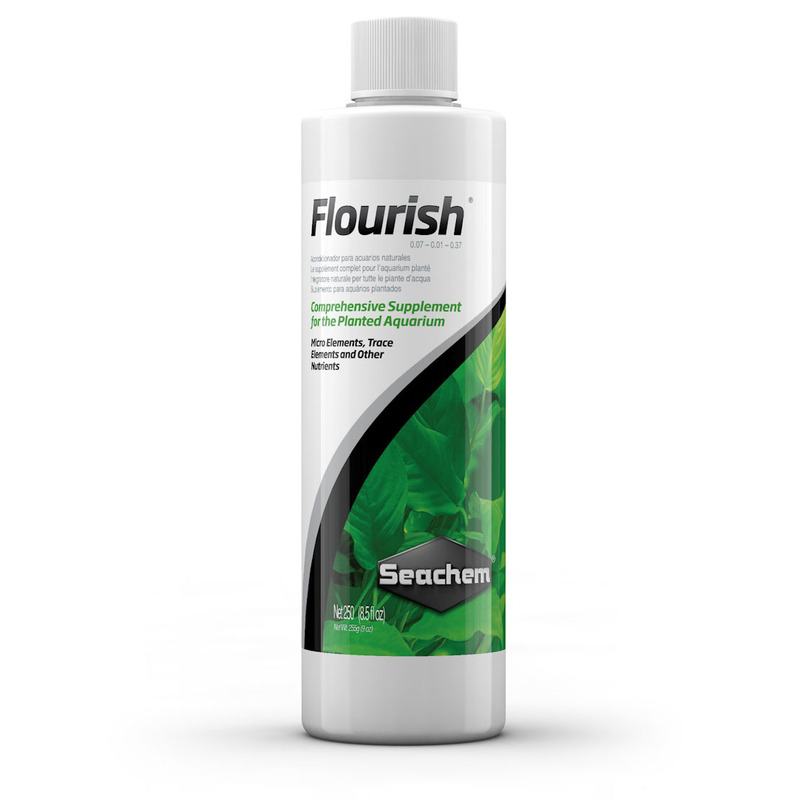 We don't sell Flourish as a macro element supplement which is why the phosphorous, nitrogen and potassium levels are as low as they are. Q: I see that Flourish contains copper. Is it safe to use with shrimp? A: Yes, Flourish is safe to use with shrimp. It is true that in large amounts, copper can be toxic to aquatic animals and invertebrates like shrimp and snails can be particularly sensitive. However, copper is needed in trace amounts by both plants and animals, including shrimp, which is why we include it in Flourish, Flourish Trace, and our other Trace products. The amount of copper in Flourish is so small that you would have massively overdose before you would begin to approach an amount of copper that is toxic to even the most sensitive animals. There is usually much more copper in tap water than there is in Flourish. Q: Does Flourish affect pH? A: Used as directed, Flourish will not alter pH.